This article originally appeared in the FebEx2013 Programme. FebEx2013 sees the first official exhibition of my On30 layout, Silver Creek (unless we have had to change the name again – but more on that later). I say first official, as it went to a railway exhibition/open day at Burlesdon Brickworks in 2011, and has been at a few Group open days in Alton, but this will be its first official outing at a proper exhibition. 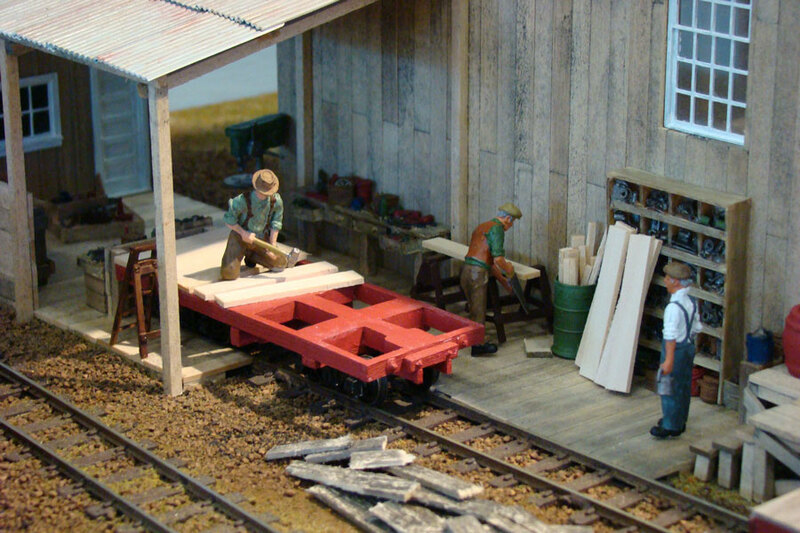 Work has been verging on frantic in the last few months to get things finished, including three new buildings (a rigging shed, blacksmiths and saw filers shack), a new baseboard that has the creek that gives the layout its name, and a multitude of figures and additional detail. The layout started life when Bachmann started introducing its On30 range – I picked up first a Porter, then a Gas-Mechanical, and then discovered Boulder Valley Models. They produce a small range of resin kits for stock and loco conversions in On30, of which I have subsequently bought (although not necessarily built) a fair number. plans for a two line engine house, with attached car workshop. This seemed like the ideal focal point for a layout, giving a reason for my range of locos to be used, so I scratch build it. The original plans were for a stone building, but as I had decided to model a logging operation, I instead made it in timber. Peco’s introduction of an On30 turntable added to the plan, which eventually turned into a 4.5m long layout (including a 1m fiddle yard). 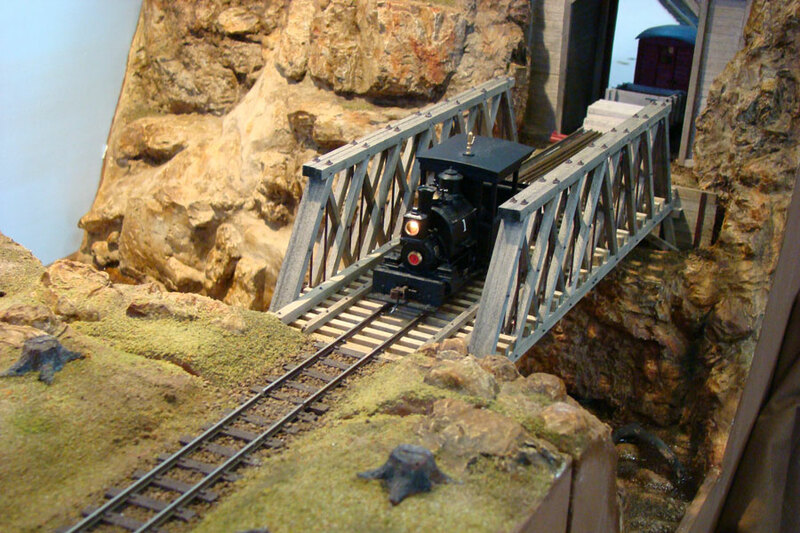 The layout is DCC driven, using the Digitrax system. DCC was an obvious way forward when Bachmann first started chipping all the locos, and then introducing sound. Note that if you have older Porters from Bachmann it is best not to chip them, but get a new one instead – believe me it’s far less hassle that way. Point motors and the turntable are also DCC controlled, with the turntable motor fitted with a basic loco chip to control the motor. Of the layouts motive power, most is from Bachmann (the standard Climax, Porter and Shay, as well as Gas-Mechanicals, Forney, and a 4-4-0), plus a Precision Scale Goose and a few resin conversions. Rolling stock is all kit built, mostly from Boulder Valley Models, with a few Chivers’ kits as well. 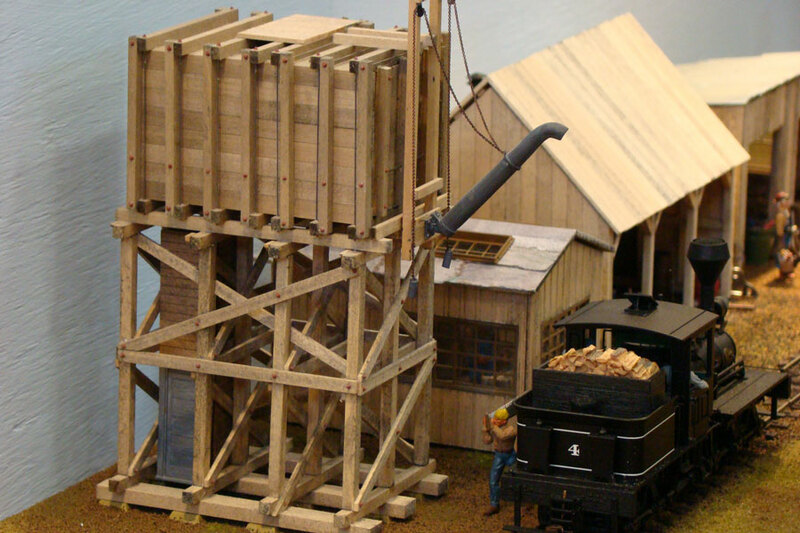 Structures are mostly scratch built, with the water tower and bridge being craftsman kits. The freight depot and grounded boxcar are kits. You would not think that naming your layout would be that difficult, and it wasn’t for us, until fellow Group members came back from Tolworth to say that they had seen an American layout named ‘Beaver Creek’ – the original name for mine. After spending about 6 weeks just calling it ‘my layout’, it finally became ‘Silver Creek’ just in time to make it into this guide. Next is a couple of weekends off – we seem to have spent most of our spare time in the last two months working on the layout. After that there are a couple of additional buildings that I have not yet had time to build – a small sand drying shed, and a loco log cutting and storage shed, followed by further work on stock and detailing the interior of the Engine House, in time for my next exhibition at Wilton (Salisbury) in May. Then, being a glutton for punishment, it’s an extension to the layout to include a logging camp and additional fiddle yard, then baseboard building for my father’s HO layout and completion of the Groups new HO layout. I definitely need my head looking at.